Lennox, John. 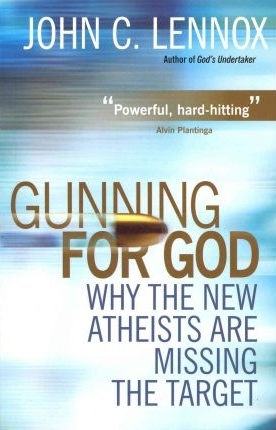 Gunning for God, Why the New Atheists are Missing the Target. Oxford: Lion, 2011. This book addresses a particular subset of Atheists—the self-styled New Atheists such as Dawkins, Harris, Hitchens, and Hawking. Lennon, an Oxford Mathematician, is generally quite methodical in his critique of the New Atheism, though it would be a mistake to conclude that he does not play to win. He points out that what makes the New Atheists new is not their arguments, but rather their aggression which he points out in Hitchens’ statement “Religion poisons everything.” In other words, the New Atheists are not content to deny the existence of God; rather, they intend to demonstrate that religion is not only a force for evil, but is the primary source of evil in the world. Lennox sets a foundation for the discussion by shooting down some popular—and childish—misconceptions about how theists approach science and reason. He then goes on to address the idea that religion is poisonous, demonstrating that this generalization steps well beyond the limits of the reasonable. He then turns the tables by asking the question “Is Atheism poisonous?” A brief discussion of Hitler, Stalin, and Lenin is followed by an attempt to demonstrate the dogmatic fundamentalism of the New Atheism, for instance quoting Sam Harris: “Some propositions are so dangerous that it may even be ethical to kill people for believing them.” He goes on to address the issue of morality, the nature of God, and miracles. Lennox closes the book with a chapter on the resurrection of Jesus Christ from the dead asking questions about history that no reasonable person can ignore and that the New Atheists can’t answer. First, this book is well written, logically sound, and profoundly credible. Lennox speaks from an academic standing that cannot be laughed off, and with a simple clarity that cannot be brushed aside. Indeed, Lennox has publicly debated both Dawkins and Hitchens with gratifying results. Second, Lennox approaches this topic with an admirable moderation. There are times when his sarcasm is a bit too much, and he certainly isn’t afraid to go for the jugular when the argument requires, but in general his style is level and reasonable, not raucous or shrill. Third, being a Mathematician, Lennox’s use of logic is forceful often leaving one embarrassed for his opponents. While there are certainly credible Atheists making reasonable arguments, Lennox exposes the New Atheists for the intellectually infantile muckrakers they are. Fourth, Lennox handles the gospel well, even leading me through tears and laughter in that chapter—no small feat for a book on apologetics! The reader is confronted with the historical person of Jesus Christ and the response he demands is pressed. First, Lennox is no theologian. That is no slight on him per se, but it does mean that his handling of theological issues is not as strong as it could be in some places. Second, the above comment is reflected in how Lennox handles this topic. His arguments are rarely primarily theological. There is not even an emphasis on philosophy (both key arenas for this discussion traditionally). His emphasis on science and reason, while somewhat unfortunate from some perspectives, perhaps makes the book more accessible to the average reader. Third, epistemologically, Lennox seems to lean toward a fideistic evidentialism, but without the presuppositional approach to apologetics that I would argue for. This, perhaps, reflects his lack of emphasis on theology and philosophy. Gunning for God is a good book. It should be helpful to believers either wanting to refute the New Atheism or to settle doubts. It is also suited for New Atheists who honestly want to understand the arguments against their position.